Major League Baseball announced the 2017 Cy Young Award winners on Wednesday evening, and both winning pitchers happen to be previous winners of the award. Max Scherzer of the Washington Nationals won in the National League, taking home the award for the second consecutive year and third time overall. In the American League, the Cy Young was awarded to Cleveland Indians ace Corey Kluber, who previously won the Cy Young in 2014. Kluber led the American League in both wins with 18 and ERA at 2.25. He was once again the ace of Cleveland’s pitching staff, which had the lowest ERA in the majors. Considering the short offseason after last year’s run to the World Series, the accomplishments of Kluber and the other Indians pitchers are even more impressive. Despite plenty of worthy contenders, the Cy Young race was ultimately a runaway in the American League. Kluber received 28 of the 30 first-place votes. Red Sox lefty Chris Sale received the other two, finishing a distant second. Luis Severino finished third in the voting followed by Kluber’s teammate Carlos Carrasco. In the National League, there was once again little doubt that the award belonged to Scherzer. In fact, aside from winning only 16 games instead of 20, Scherzer’s numbers were better in 2017 than they were last year. In 31 starts, Scherzer posted an ERA of 2.51, the lowest of his career. Opposing batters hit .178 against him, 21 points lower than last year’s mark of .199. Scherzer’s win was almost as much of a runaway as Kluber’s was. He received 27 of the 30 first-place votes, with Clayton Kershaw receiving the other three. 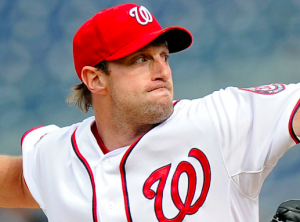 By beating out Kershaw, Scherzer denied the Los Angeles lefty his fourth Cy Young. That sets up both pitchers to chase Cy Young no. 4 in 2018. Finishing third in the National League was Scherzer’s teammate, Stephen Strasburg, followed by Zack Greinke. Scherzer is on a list of just 10 pitches, including Kershaw who have won the Cy Young at least three times. Only four have won the award at least four times. Both Scherzer and Kershaw have a chance to join that elite company next season. Meanwhile, Kluber will spend 2018 trying to match Scherzer, Kershaw, and others as a three-time winner.